A long-neck relative of Apatosaurus and Diplodocus has been discovered in South America, becoming the first of its kind ever found on that continent. Discovered in rock from the Early Cretaceous Period about 140 million years ago, the new dinosaur lived later than its relatives found in Africa, Europe and North America, which hail from the Jurassic, the period before the Cretaceous. At about 30 feet (9 meters) long, the new long-neck is also a relative pipsqueak. 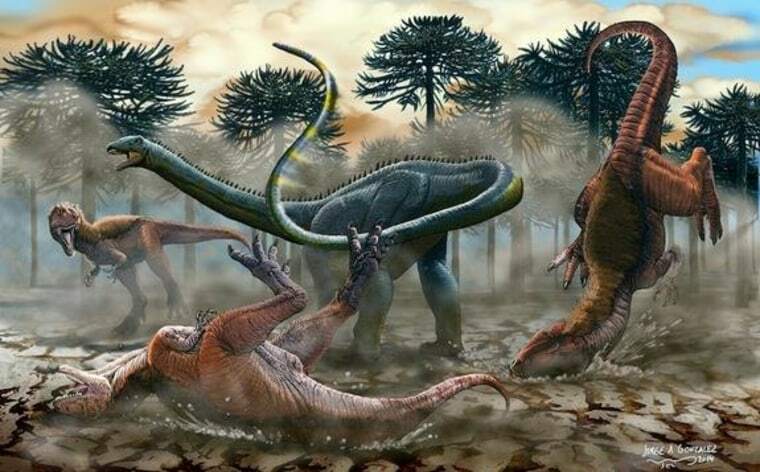 Other dinosaurs in this group — the diplodocids — are more than 66 feet (20 m) long, said study researcher Pablo Gallina, a paleontologist at the Universidad Maimonides in Buenos Aires. Gallina and his collagues excavated the fossil during three trips to Patagonia in 2010, 2012 and 2013. The fossil site is in Argentina's Neuque´n province, where the landscape is dry and scrubby, with reddish dirt hills. In the Early Cretaceous, the environment would have been semi-arid, bordering a large desert on the supercontinent of Gondwana, Gallina said. The skeleton is fragmentary, but the researchers were able to use the shape of the animal's vertebrae to determine that it was a new species. They dubbed the dinosaur Leinkupal laticauda. In the language of the native Mapuche people of Patagonia, "lein" means "vanishing," and "kupal" means "family." The researchers chose this name because previously discovered diplodocid relatives come from the Jurassic, meaning L. laticauda may have been among the last of its line. The second part of the dinosaur's name has meaning, as well. "Lati" comes from the Latin for "wide," and "cauda" from the Latin for "tail." The vertebrae suggest that L. laticauda had a very broad, muscular tail, which may have allowed it "remarkable control and fortitude," Gallina said. Diplodocids are famed for their long necks and long tails; the earliest discovered specimens came from the rich Jurassic fossil beds in Colorado. They had also been discovered in Africa, which led paleontologists to suspect they lived in South America as well. At the time this group of dinosaurs lived, the two continents were combined into one, called Gondwana. The researchers report their findings today (May 14) in the open-access journal PLOS ONE. This an a condensed report from Live Science. Read the full report. Follow Stephanie Pappas on Twitter and Google+. Follow us @livescience, Facebook & Google+.